And once again, a young lady who finds herself in over her head — in the kitchen! 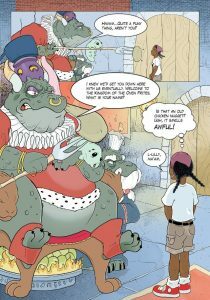 This time it’s Malice in Ovenland, published by Rosarium, written and illustrated in full color by Micheline Hess. “Lily Brown is a bright, curious, energetic young girl from Queens, New York. When her mom forces her to stay home for the summer and do chores, Lily fumes. Little did she know that the greasy oven in the kitchen was going to give her more excitement and adventure than she could possibly handle.” Apparently that involves a visit to a land of giant lizards and other fantastic creatures. Now Rosarium have released the Malice in Overland graphic novel, collecting the first four issues of the comic in hardcover. Check out the new trailer on YouTube.